UFIT Fitness and Health Retreat: January, 2016. Our fitness retreat in Thailand saw a group of awesome clients enjoy a fit and healthy weekend at the stunning Thanyapura sports resort in Phuket. The weekend was the perfect blend of fitness, healthy eating, education seminars and relaxation. “Myself and Philipp joined the UFIT Phuket retreat following the advice of Frazer my coach Frazer. Boy was that a great decision… It did cost fair amount of money but it was worth every penny! Training sessions twice daily starting from 7:30am …at first we were a little worried perhaps we’re not tough enough to sustain this level of training (worth mentioning- we were training next to couple of National Olympic swimming teams also staying in the hotel at the time) but in the end not only we managed to complete all the sessions but also felt much more energised and “strong like a bull” for it. Both coaches Frazer and Rachel proved their skills as top level trainers by planning out sessions and its content in the way that we worked really (really!!) hard yet still had enough energy to complete all the programme. It was a perfect combination of motivation and push we really need sometimes plus professional advice tailored specially for each and every one of us separately. They also proved really fantastic and friendly hosts! Frazer’s ability to crack jokes when you think you’re dying is irreplaceable! We appreciated having a little bit of a free time as well while we even attempted playing golf….we failed miserably, it was tough due to lack of energy but it just goes to show how much the rest time was needed. All together absolutely TOP retreat from which we came back feeling stronger and healthier. Fantastic weather was just another value added. We really hope there is more to come! With special thanks to Frazer for looking after us so well! Arrival at Thanyapura fitness resort. Everyone had some time to explore the resort and its facilities, eat lunch and relax by the pool before the first workout session with trainers Frazer and Rachel. We started with some high intensity conditioning work and then did a strength session with weights. Clients who hadn’t done any lifting before learnt new skills and other clients worked on increasing their existing strength. The morning workout session focused on high intensity speed work. After warm up the team got onto the athletics track for sprint training. Emphasis was on maximal effort but also ample recovery. The session was followed by a presentation from coach Frazer on the importance and benefits of high intensity interval training. Team breakfast was most definitely earned! In the evening session, the team got into their second strength session. Day two focused on ‘push’ movements. In two groups led by our coaches, everyone worked through a full body workout in Thanyapura’s state of the art gym. The session finished with a cardio blaster on the track of running, burpees, sit ups and push ups. We ended the day with a team dinner at Thanyapura’s restaurant, where we were sat next to the German and Netherlands Olympic swim teams training for Rio 2016! Sore muscles, full bellies and another morning workout ahead – everyone was in bed early. On the final day, we did a ‘strongman’ workout. Strongman training is designed to produce true functional strength. It involves, pulling, pushing and moving large heavy objects. 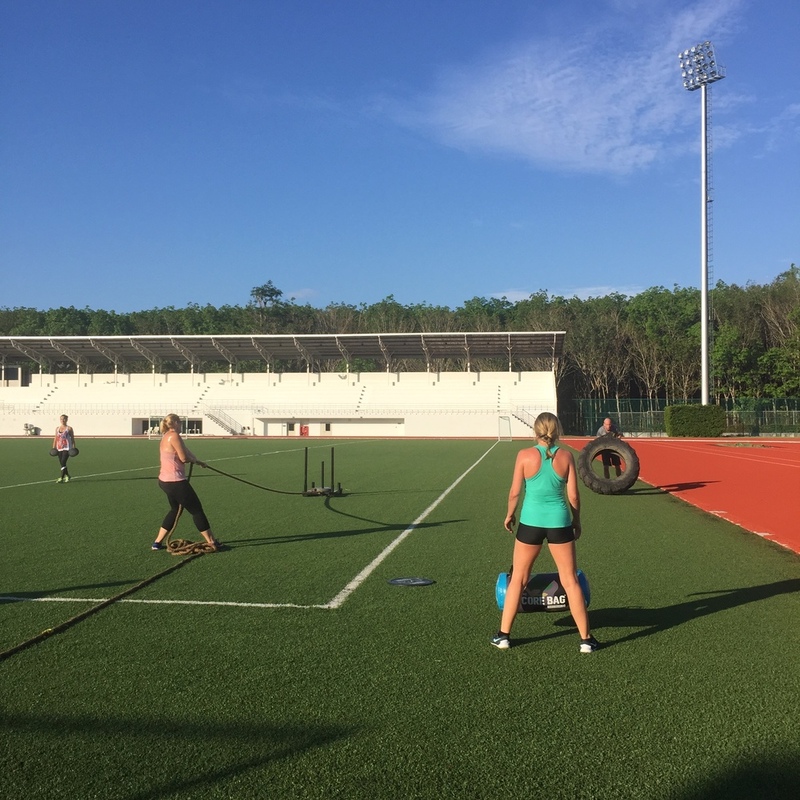 Our last session was a big strongman circuit on the athletics track with everyone putting their all into the last workout. Then we had just enough time for a few hours of sunbathing (or golf in some cases) before heading back to Singapore. For three rounds. 1 person per station. All in all, a fantastic weekend. We will be back! Older PostUFIT Movement of The Month: Lateral Lunge and Cable Row.